Spring in to Organization and a Freebie - All Things Special Ed. 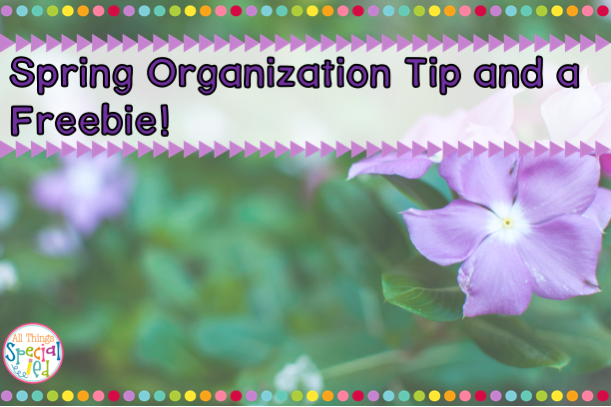 Spring is in the air and who doesn't love cleaning and getting more organized? 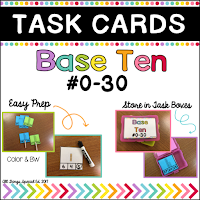 Read on to learn more about how I organized my task cards and to grab a freebie! Who doesn't love being organized? Have you seen these wonderful "Task Boxes" that keeps popping up on your news feed? Well I couldn't resist any longer and had to jump on the bandwagon! These task boxers are perfect to hold task cards as well as many other things! You could store your PECS in these or use these as you visual holder for your "Working Towards" reward schedule. completed the task. It is prefect to hold all your extra reward pictures on the inside. Another idea is a "First/Then" board and all your extra pieces can be stored on the inside. These are the task boxes and it comes in its own storage case. You can find these at Michaels. They are called, "Iris Photo Box, 16 cases"
They can be pricy, so make sure you have coupon and/or when they are on sale! These boxes are 4x6 and are great for holding your task cards! I created a freebie to get you started and I will be adding more math task cards in the near future so make sure to stop back at my store, All Things Special Ed. This task card set is called "Base Ten" and comes with 60 cards, 30 colored and 30 black and white (print on bright colored paper to get an added pop of color and not waste colored ink!) This set includes numbers 1-30 and you can use a dry erase marker or clothes pins for students to record their answers. Leave a comment and let me know what kind of task cards you are looking forward to seeing in my store! Since spring is in the air and I teamed up with some fabulous teachers for a few more freebies! Stop by their blog to grab even more freebies! I love those colorful Iris boxes! I can think of a lot of things I could do with those! Maybe something I can afford next month.